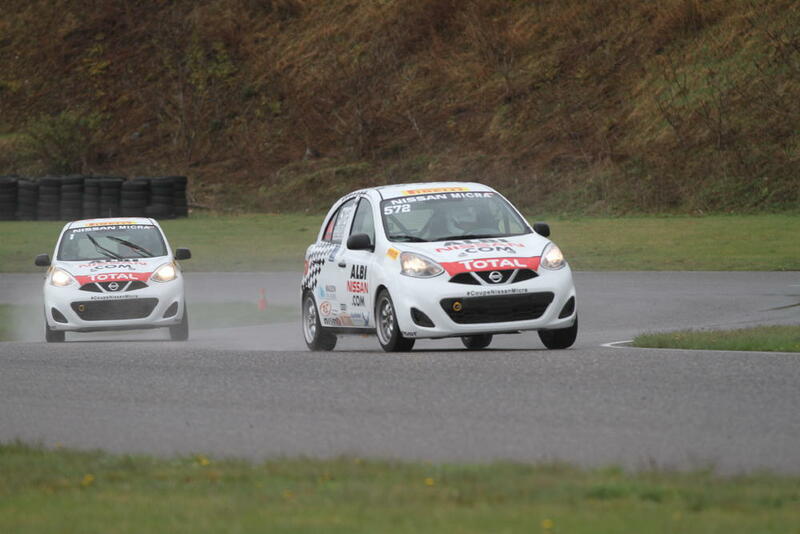 The Nissan Micra Cup officially started its 2016 season this past weekend at Ontario’s Calabogie Motorsports Park. An event dampened by difficult weather conditions saw rain, wind and unseasonably cold temperatures challenge the drivers. At the wheel of their fun-to-drive, agile and practically stock Nissan Micra S cars, the drivers put on an exciting show during both races this past weekend, with victories going to Kevin King and Xavier Coupal. Nic Hammann, a young American driver from the Nissan GT Academy team, earned the pole position for Saturday’s race under heavy rain conditions and less than twenty-four hours after first test-driving his Nissan Micra on the Calabogie track. Behind him were Kevin King, of the Sorel-Tracy Nissan team, the Albi Nissan team drivers, Xavier Coupal and 2015 champion Olivier Bédard, Stefan Rzadzinski of Alberta (Pneus Touchette team) and the Quebecker Metod Topolnik (Azure Racing team). Held on Saturday afternoon on a track that continued to dry as the laps went on, the first race of the 2016 Nissan Micra Cup included more than twenty-five drivers and was quickly controlled by Quebecker Kevin King. King managed to hold off constant pressure from Xavier Coupal, Olivier Bédard and Nic Hammann, as the four remained a pack for the duration of the race, finishing within three seconds of each other. Bédard was eventually disqualified when his Micra did not meet the minimum weight requirements. Stefan Rzadzinski therefore completed the top four, ahead of Metod Topolnik, who fought off pressure from veteran drivers Jacques Bélanger and Normand Boyer, both new to the series. Another great battle took place for eighth place, which was eventually granted to Valérie Limoges, who finished ahead of Valérie Chiasson. Nicolas Touchette was tenth and Ashley Sahakian earned the top spot amongst the novice drivers. At Sunday’s race, Nic Hammann once again started in pole position but a multi-car collision at the first turn eliminated several favourites, including Hammann, Bédard, King and Chiasson. All drivers are unharmed. The then shortened race was dominated and won by Xavier Coupal, ahead of Stefan Rzadzinski and Jacques Bélanger. Valérie Limoges was able to overtake Marc-Antoine Demers for fourth place. In the drivers’ championship, Xavier Coupal leads with 76 points, ahead of Stefan Rzadzinski (66), Jacques Bélanger (52), Kevin King (45), Valérie Limoges (44) and Nic Hammann (40). As for the novices, victories were split between Ashley Sahakian on Saturday and Stéfan Gauthier on Sunday. The first race weekend in the 2016 Nissan Micra Cup definitely held up to the expectations for the season ahead and the endless action is a sign of things to come. The next race weekend is happening at Circuit Mont-Tremblant, which is where things kicked off last year for the 2015 Nissan Micra Cup.